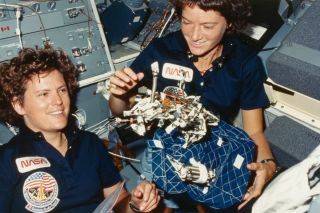 Former NASA astronauts Kathryn Sullivan (left) and Sally Ride show off their design for a zero-g sleeping bag inside the space shuttle Challenger during the STS-41-G mission in October of 1984. Carie Lemack is co-founder and CEO of DreamUp, the first company to bring space into classrooms and classrooms into space. A former national security policy expert/advocate and a producer of an Academy Award-nominated film, Lemack is a proud alumna of Space Camp and a supporter of all space cadets reaching for the stars. Lemack contributed this article to Space.com's Expert Voices: Op-Ed & Insights. To march is to "walk or proceed quickly, and with determination" — a fitting definition for the month of March, as we celebrate Women's History Month and commemorate the achievements of countless women, including in the fields of space travel and astronomy. Indeed, so indispensable are their contributions, and so influential are their most indispensable contributors, that there wouldn't have been a space race without the efforts of those whose gender constitutes more than half of the human race. It is important for our fellow citizens to know the things they would not have if it weren't for the achievements of women. Many of these are things people now could not do without. I was such a girl, not that long ago. If I have seen more than I ever imagined, it is not because of how tall I am, but because no one cared how small I was — and still am. At 4 foot 10 inches tall, I do not cast a giant shadow, but I have been blessed to walk among women who are giants. They encouraged me to dream big and do things bigger than I thought possible. The roll call of women who have made history by expanding our knowledge of the history of the universe includes Vera Rubin, whose work confirmed the existence of dark matter; Carolyn Porco, one of the leading authorities on planetary rings; Nancy Grace Roman, NASA's first chief of astronomy, whose support for orbiting telescopes was instrumental in the creation of the Hubble Space Telescope; Margaret Geller, a senior scientist at the Smithsonian Astrophysical Observatory; Debra Fischer, the founder of Planet Hunters; Carolyn Shoemaker, an astronomer who holds the record for most asteroids and comets named in her honor; Sally Ride, the youngest U.S. astronaut to have traveled to space and the first U.S. woman to have done so; and Mae Jemison, the first African-American female astronaut. We need more women to inspire us, and we need more men confident enough in themselves to place their confidence in women smart enough to know — and strong enough to do — the hard work of science. We need not look only for female Nobel Prize winners, not when there are so many women noble in spirit and noteworthy in their own right. Not when there are female professors who can guide us and women in the hard sciences who work to make the world a better place. We honor not just the history of women, but also women whose leadership is historic, whose long record of success is why we study history, whose longevity brightens and glorifies the pages of history. We honor every woman who seeks to make history, because all women should know they have a right to pursue their dreams. We dream of great things. We dream to go up, to light a path as pioneers of a new frontier where the laws of physics are blind to race, religion and gender. We know, too, that if we will it, it is no dream. Let us be united in this cause, so every girl may be proud of who she is and what she can accomplish. Let us empower women by the power of our example, so history may say of us, "We walked quickly, and we proceeded determinedly, to transform our dreams into deeds."